Camping is an affordable way to explore the Whitsundays. With gorgeous bays, secluded beaches, coral reefs and over 30 campsites to choose from it is the ultimate camping experience. We camped on Whitehaven Beach on Whitsunday Island, the most popular and busiest island in the Whitsundays. There are many other alternatives and it’s even possible to camp on your own private island. On our transfer back to Airlie Beach, we dropped a couple and their little baby off at Crayfish Beach on Hook Island to camp. We were in awe of the stunning and secluded beach. They were ecstatic as they had the whole beach to themselves for an idyllic couple of days. Camping is available on many of the islands in the Whitsundays, including Hook Island and the Molle Islands. Some are more popular with backpackers, day-trippers and groups. Some are less known, remote and romantic. On Whitsunday Island, there are eight campsite locations with a new one – Cairn campsite on the northern end of Cairn Beach recently opening. Here the snorkeling and bush walks are apparently the best on Whitsunday Island. Unlike most of the other campsites in the Whitsundays mobile phones can get reception from here. If making the bookings yourself, make sure when you arrange your island transfers that camping permits are available and vice versa. The closer to Airlie Beach the less expensive the transfers are; South Molle Islands are $65 per person return, Cid Harbour $105, Whitehaven Beach $155 and Hook Island $160. Just because the Islands are close to Arlie Beach doesn’t make them any less secluded or picturesque. There are some beautiful spots at Molle Islands and Cid Harbour. 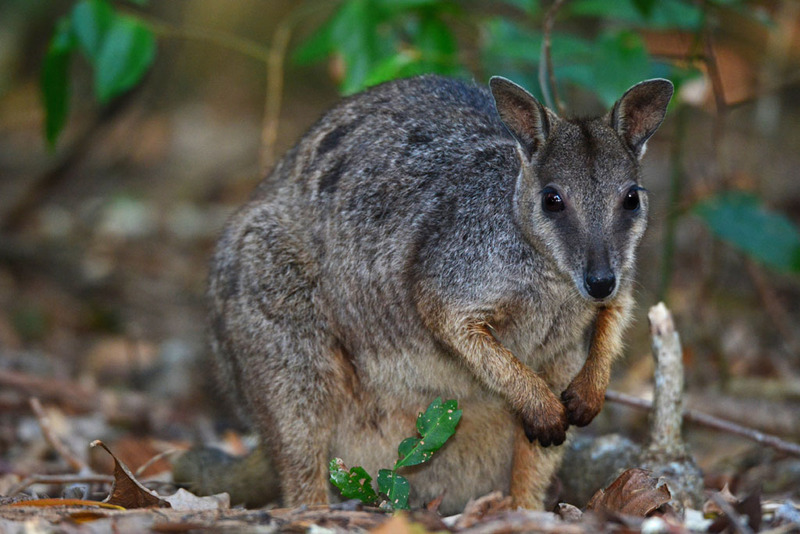 Cute Wallabies visit our campsite. Some of the campsites have beach frontage and a great view but they have no shade or protection which can make it uncomfortable during the day. Food needs to last and heat can spoil it. We thought it looked awesome and grabbed a beach frontage site when we first arrived, but by the afternoon we moved to one further back in the cooler forest. Most of the campsites have a picnic table and eco-toilets. Other campsites are more rustic with bush camping and have no toilets or picnic tables. Individual and group camps are available. There is no drinking water on the island so the water needs to be used wisely. Because we were in the ocean all the time, we didn’t miss having a shower. Hair ends up looking like straw, sand ends up in the bed and food is extra crunchy, but that’s all part of it! Here is the map of the camps and a facilities guide. The new campsite on Cairn Beach still isn’t shown on the map. It is on the northern tip of Whitsunday Island, with views of Hook Island. If you don’t have your own camping equipment you can hire it at $40 for the first day and then $20 per day every day after that with Whitsunday camping or Island transfers. Snorkel equipment and stinger suits can also be hired. As long as you are sensible there are no restrictions on the luggage and equipment you take over on the transfer boat. We don’t camp lightly and following is what we carried over and was easily managed. 2 large containers of water (water and containers are supplied by Whitsunday camping or Island transfers). Hats and lots of sunscreen! Our mini iPads. The right size for a kindle and an essential travel item for us. We both love reading and they are perfect for reading in tents, on planes and trains when the lights are off. Books are cheap to download whenever and wherever you are. They are compact and light to carry if you read a lot. The best thing is, Lonely Planet guides are less than half price. The transfer boat drops campers off on the beach and it’s only about 50 metres maximum to most of the camps, so no need to worry how far you have to carry the camping equipment. If you are prone to seasickness take precautions as it can get bumpy on the transfer! Boat transfers depart from Shute Harbour in Airlie Beach every day, and take about 90 minutes, depending on how many campers they are picking up and dropping off at the islands. Generally, the boat transfers are early morning (depends on the tide). Do camp shopping the night before. There is a new Woolworths supermarket in Airlie beach. It is also possible to negotiate transfers to more than one campsite. For example, camp at one campsite for a few days and transfer to another one. This is the view from the northern lookout. Across the inlet is the Hill Inlet lookout. This walk takes about 2 hours from the Whitehaven Beach campsite. Be prepared and take lots of water when doing the walks. They don’t sound far but they can take longer than what they appear. We walked from our camp at Whitehaven Beach to the Hill Inlet lookout which takes about 2 hours and is about 7 km. We stopped and walked to another lookout on the way and spent time at the inlet and this took us most of the day. If walking from Whitehaven Beach to Hill Inlet you need to plan around the tide. The last 30 minutes of the walk involves crossing the inlet and this can’t be done during high tide. We hired a kayak during our stay; we stuck close to Whitehaven Island and paddled over to Chalkies Beach on Haslewood Island. When we did go further out, we didn’t go far from land! There are more exciting options available for serious kayakers. We met a couple who were dropped off on Whitehaven Beach and were picked up from Maureen’s Cove on Hook Island. They camped and kayaked for four days around Whitehaven and Hook Island. This requires travelling very lightly as all gear is packed into the kayak. If kayaking or camping for longer periods it can be arranged with the transfer boat to drop off food, water and other supplies. Kayaks are supplied with life jackets and safety flares. 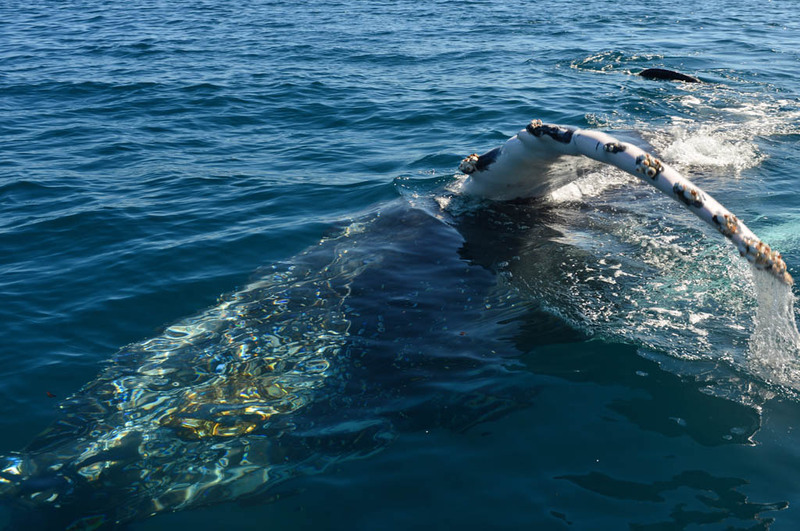 Whale sightings are getting more common in the Whitsundays. Beautiful all year, but the best time to visit is between May and September. The weather is perfect and not too hot. There are no stingers this time of the year and no stinger suit is required. June, July and August are the coolest months and November, December and January the hottest. During summer the average temperature is over 30°C and winter about 23°C. The blue butterflies congregate and gather together in their thousands during the cooler months of June and July. Stinger season is between October and April and during these times a stinger suit needs to be worn while in the water. 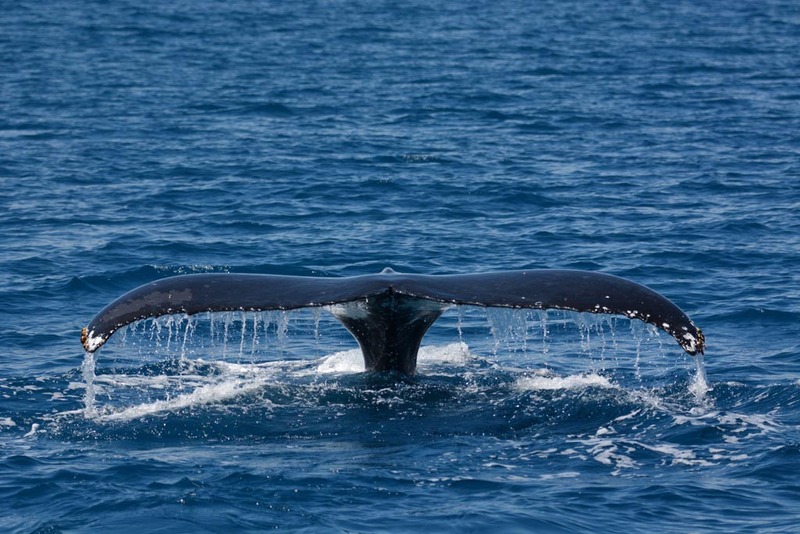 There is also a chance to see migrating whales between June and September. We stayed for four nights and that was the perfect amount of time for us. We think two nights is a minimum amount of time. 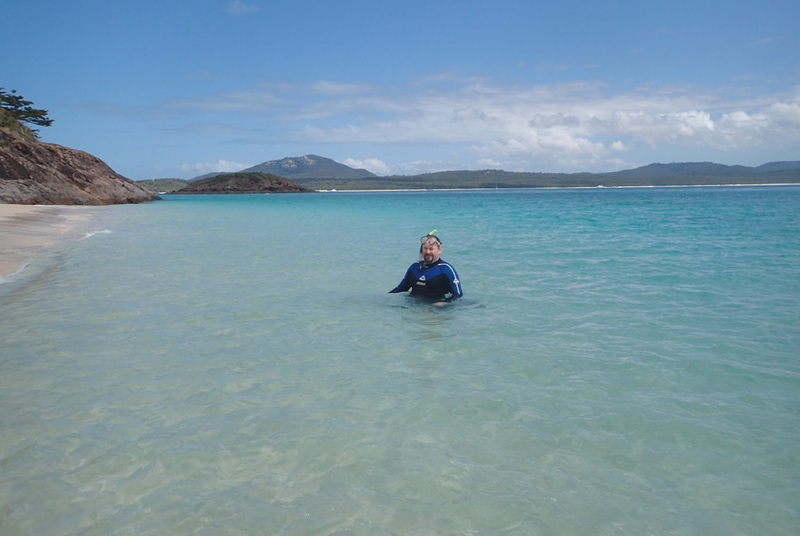 Snorkeling on Whitehaven Beach doesn’t have the best snorkeling and at times the water is unclear. When the visibility is good, the best site is the little reef in front of the camp. 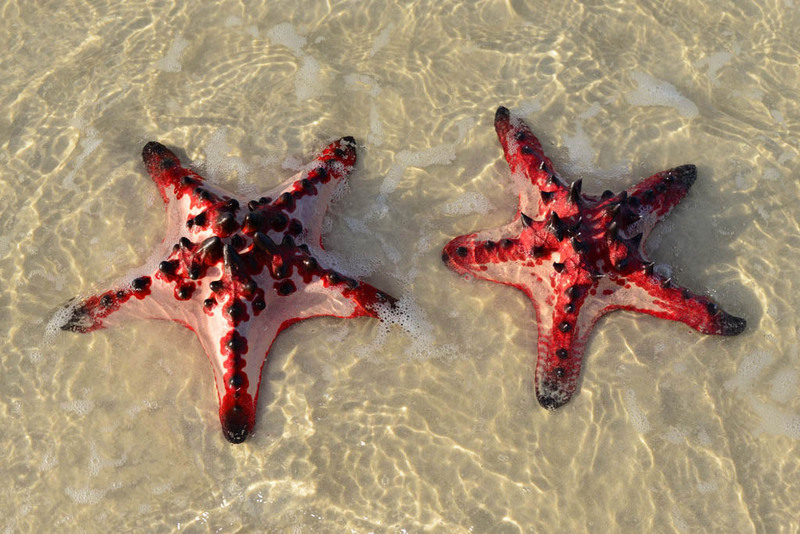 The marine life is more abundant at Chance Bay, Chalkies Beach and Hook Island. Low tide is the best time for snorkeling. Phone service is nearly non-existent. There is some reception at the lookouts but it comes and goes. Mozzies and sand flies can get annoying though we didn’t encounter them. Bring repellent just in case. If you prefer to do a day trip, take the time to check what they offer and if they suit your individual interests. There are many options and varieties of tours. Some spend more time on Whitehaven rather than visiting other islands and the Hill Inlet, some spend more time sailing or snorkeling etc. Many people ask us what is the best place to visit – Airlie Beach or Cairns? We think they are two totally different places to visit and can’t be compared. The Whitsundays is unique as it has the archipelago and there is adventure such as remote island camping, great walks, island hopping and kayaking adventures. All this can be done independently and self-designed itineraries. 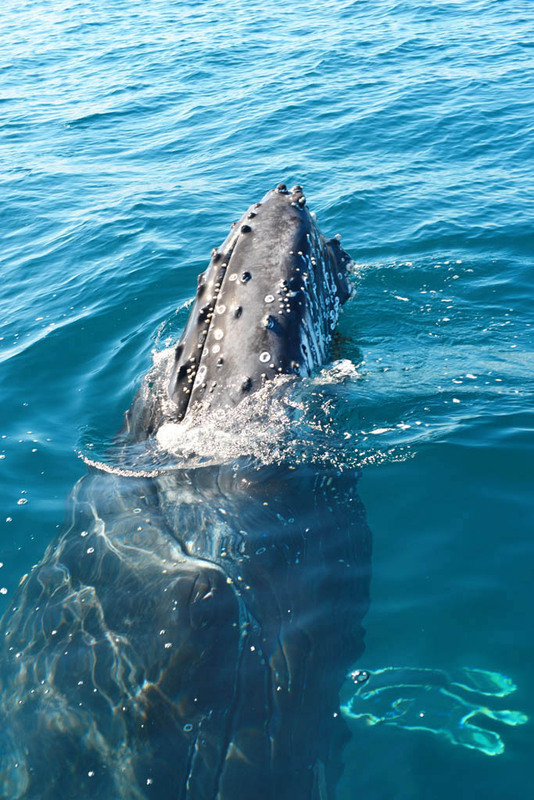 Snorkeling and diving in the Whitsundays are pretty, but we think nowhere near spectacular as outside of Cairns. If your interest is solely diving, the far north is exceptional. The further out of Cairns the more spectacular the diving is. If there is one luxury you can afford; a trip out with one of the liveaboards is the ultimate. Island boat transfers are with Island transfers. 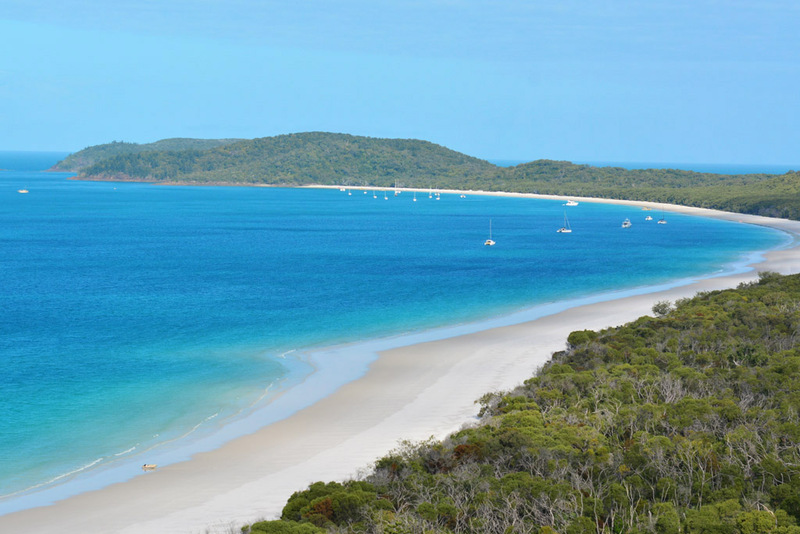 Transfers to Whitehaven Beach are $155 per person return. Camping permits are $5.50 per day per person. Salty Dog Kayaking charges $50 per day for a double sit on top kayak. Half day guided tours to six-day expeditions are also available. Camping transfers, kayaks, accommodation and all other tours can also be booked as one package with AirlieBeach.com. Information and bookings for the different Whitsunday campsites When you make bookings for a campsite online you can check how many people have already booked and what campsites are available. Your travel tips are the best. You think of the smallest details, that people would worry about. All your blogs especially Australia is so beautiful. I hope to visit one day. Thanks for your comment Rehana. Australia is a beautiful place and we hope you make it here one day. If you have any questions, please get in touch with us. First of all I would like to congratulate you on an amazing blogs. I am no doubt one of the many who is gobsmacked by your WOW images and high quality work. I tis so unique to many others that I see. I ony just come across this after searching for whitsundays and whitehaven also fraser island. I have never seen the wild dingos photographed in this way, it is really incredible how they are hanging around in your camp. You make it a hard choice if one was to choose between these 2 places. 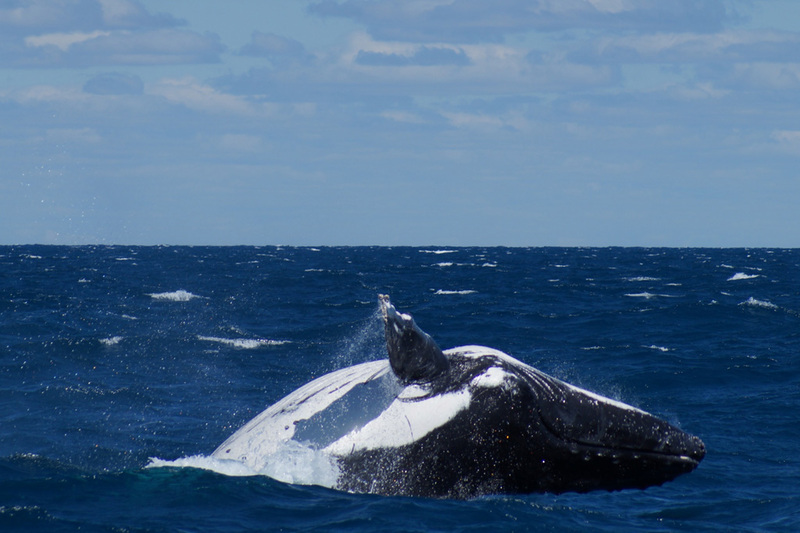 I also notice you don’t have anything on Harvey Bay where there are also whales. For example if you only had 4 days to spend where would you like to spend it Whitsundays or fraser? Thank you so much for these amazing images and blogs. Thank you for visiting our site and your comments Ryan. Hopefully we will make it to Hervey Bay next year! We love the Whitsundays but personally Fraser Island is our favourite. It is a special place for us and we have a soft spot for the wild Dingoes. On Fraser Island you can pull up a camp and feel that you are the only ones on the whole Island. 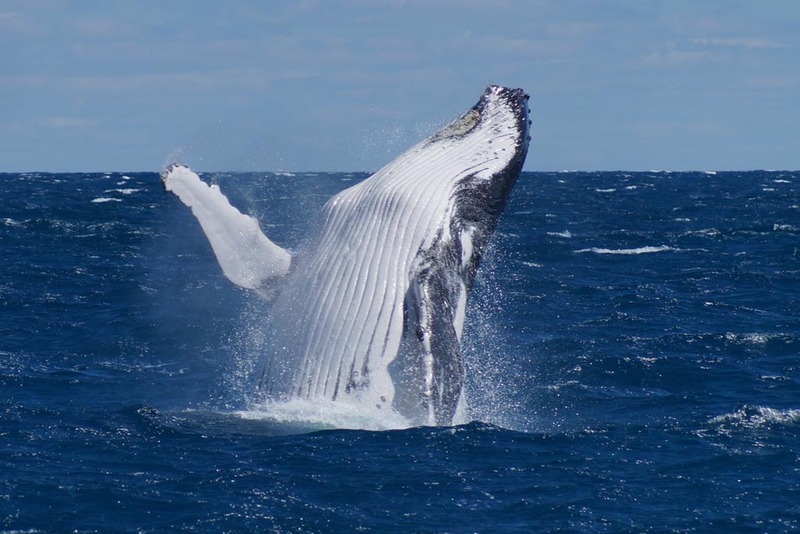 Hervey Bay also has the whales in the right season. How ironic is this to be on the place. I mean, its very rare for me to see that this place is full of such creatures that hide in the beauty. Amazing pictures- got inspired and am planning to go there in October. Do you have to book the camp sites in advance? Thank you! It’s an amazing place to camp. No there shouldn’t be any need to book in advance. Mid to late October is a quite time. You can look on the QLD National Park website and check availability. Currently most of October there is availability for 36 people on Whitehaven Beach as there are no bookings yet, so you should be OK! There are also a lot of other campsites. Thank you so much for your response. 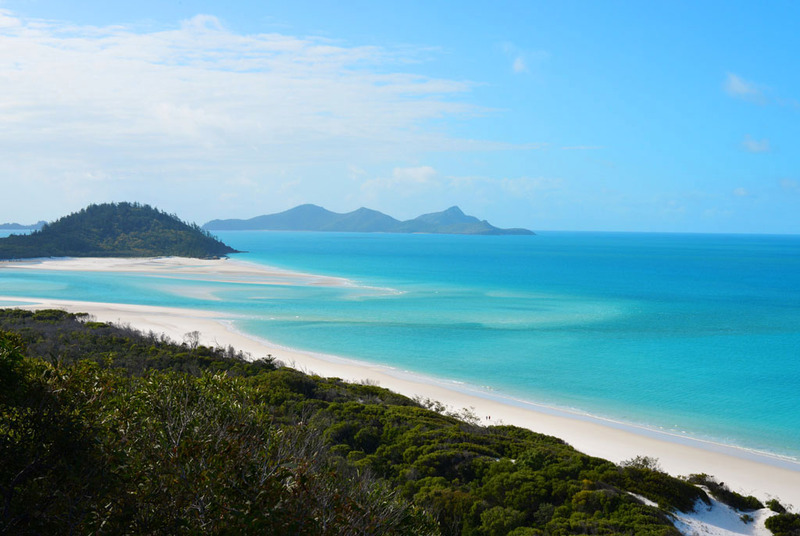 Is thewhitehaven beach the best place for the signature whitsunday pictures? Yes, Whitehaven Beach is the best place. As long as it’s not too windy you will get great photos. Hi, who did you book this trip through? I am looking to do the same in the new year but am struggling with who and where to get transfers from! Thanks! Hi Max. We went with Whitsunday Camping on the Scamper. You can also book camping transfers, kayak and other tours with AirlieBeach.com. Just wish to advise those blue butterflies photo taken at Chance Bay. Are common butterflies in Queensland. Tirumala hamata or commonly known as Blue Tiger Butterflies. 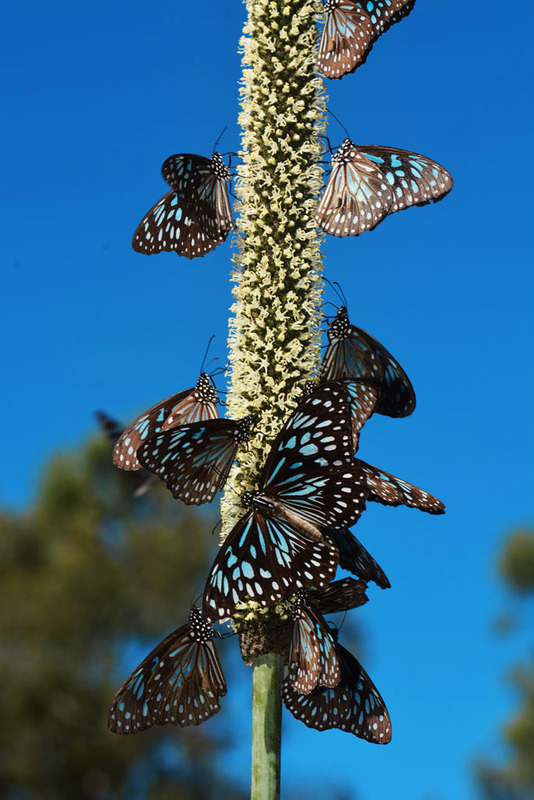 The flower spike that the Blue Tiger Butterflies are resting on belongs to the plant species – Xanthorrhoea commonly known now as Grasstrees (previously known as Black Boys, due to their black tree trunks). The grassy leaves called steel grass, are commonly used in florist arrangements. Just in case someone asks. And thank you for the wonderful info. I was unaware, you could camp at Whitehaven. I’ve only been once via a day cruise. Spectacular!